Andar por toda parte! Familiar, por Franklin & Marshall, 10 min de carro 2 Amish. Tem quatro quartos e três casas de banho completas, juntamente com uma área de estar e uma cozinha (kosher disponíveis mediante pedido), que dispõe de aparelhos de tamanho completo. O layout do quarto é como se segue. Quarto Master (1 cama queen, banheiro privativo, armário e espelho, closet). Quarto Master (2 camas individuais, banheiro privativo, closet). Rainha Quarto com armário, espelho e armário. Duas camas de solteiro com armário. Estacionamento no local em nosso lote é gratuito. Estamos perto de Longs Park, Buchanan Park, Franklin & Marshall eo RT30 on / off rampa. Lençóis e toalhas estão incluídos e comodidades básicas do hotel estão incluídos ..
Second time renting/ just as good as the first! This was our second time renting this location. Clearly we love staying here! The owner is very gracious, accommodating, and quick to respond to any concerns or needs. The apartment is very, very clean, and the kitchen is well stocked with basic cooking amenities you might need to prepare or heat food. We were pleased to see that everything was very well maintained from last year. We've already decided to stay here next year!! Don't judge a book by it's cover, from the outside it is very deceiving, inside it is brand new. 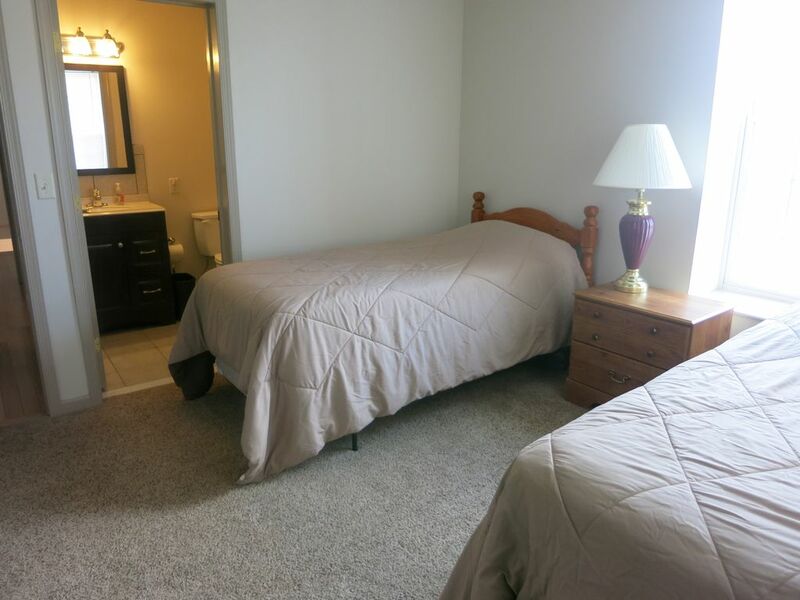 Free wi-fi, 4 large BRs and 3 full baths plus a kitchen and laundry. My only recommendation would be hand towels in the baths and kitchens, additional TVs and cable or satellite service. We love to stay here when we visit Lancaster! Great place, kind people and great location! This was the perfect place to stay for our group while we were attending a convention at the Marriot in Downtown Lancaster. It was a 5 minute easy drive downtown. It was very clean and there was lots of space. We stayed downstairs so there were four bedrooms, each with it's own bathroom. Very close to fast food and convience stores but the place was quiet at night. Great experience! This is like a home away from home. Truly! Kind people, clean, and just wonderful all the way around. I am a clean person. So renting can be challenging for me because a lot of times someone else's version of clean isn't the same as mine. However, this unit was extremely clean and very neat. The property is exactly as described. Beds were very comfortable, plenty of heat and hot water, good bedding and towels. Dealing with Rabbi Green was an extremely pleasant experience. We arrived a bit early but it wasn't a problem and he let us in right away. Both Rabbi Green and the care-taker Zoe were very responsive when we had questions. We enjoyed the convenient location which met our needs very well. When in the area again, we plan to rent this same place. Highly recommended. Nós estão localizadas na borda da cidade de Lancaster. O melhor de dois mundos (Downtown Lancaster e fácil acesso a Lancaster Farm Country). Park City Mall fica a pouco mais de uma milha de distância (o maior shopping center em Lancaster County). Outlet Shopping, mini-golfe, Amish Country e Dutch Wonderland e outras atracções turísticas são 15-18 minutos de distância. Downtown Lancaster fica a 5 minutos. Franklin & Marshall College fica a 5 minutos (a pé). Nossos favoritos pessoais são o Cherry Crest Farm eo Choo Choo Barn. Rates are subject to change until reservation is confirmed. Cancellations before 60 days of requested reservation date will be refunded. No refund for cancelling within 60 days of booked stay date. Cleaning fee of $125 for less than 3 days stay.